Inspired by the city where old world and new world unite, the Baracoa Collection infuses traditional designs with fresh Cuban flavor. From fiesta to siesta, deep blues and bright pinks bring the heat to any room’s design. - Features a Medallion design, and has fringe. Has a border. Vintage style. - Colors found in this rug include: Yellow, Blue, Gray, Ivory, Light Blue, Orange. The primary color is Yellow. 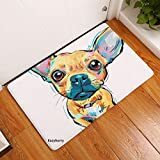 - This rug is 1/3" thick. 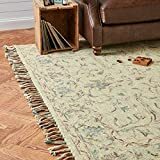 - The measurements for this rug are: 5 feet 5 inches wide by 8 feet long. - Patio, Deck Garden, Beach, Picnic, rv camping, garage, Kids rooms. Pets anywhere you can use it. - Does not Soil like Jute rugs. Easy clean and maintenance. 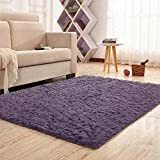 - This rug offers easy upkeep and practicality thanks to its naturally stain, fade and wear-resistant pile material. 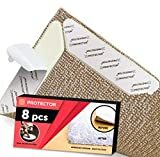 - Sturdy jute backing protects your floors and makes this rug serviceable for long years to come. 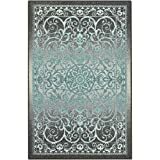 - This rug gives off an air of elegance, glory and regality with its timeless classic design. - Power-loomed construction stands up to daily wear and tear in your busy home. - Machine-made in Turkey with the hightest quality polypropylene in the pile and with durable jute in the backing for longevity. 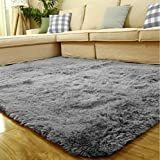 - Embellish your floors with the advantage of this shag rug's neutral-colored solid-design that harmoniously blend with most floors and furniture. 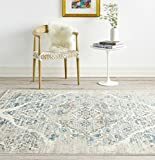 An Amazon brand - Delicate details of beige and blue accent this neutral area rug. Its soft, soothing wool lends comfort and an elegant anchor to any traditional, transitional or contemporary room. - Features a Medallion design. Has a border. Has floral pattern. Vintage style. 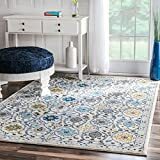 - Colors found in this rug include: Yellow, Gray, Ivory, Navy Blue, Turquoise. The primary color is Yellow. - This rug is 1/2" thick. 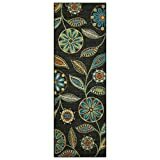 - The measurements for this rug are: 5 feet wide by 8 feet long. - [Size&Material] Size: 40*60cm/16"*24". Material: Polyester. 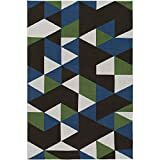 An Amazon brand - Add a foundation of textured elegance to your bedroom or living room with this hand woven, long wearing polyester/wool blend rug. 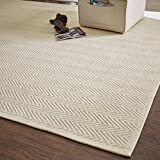 The high-low weave creates a lively chevron pattern in elegant ivory tones.